What a time you're having - first a historic series win in Australia. And now you have made some important contributions to help Saurashtra reach the Ranji Trophy final. It is a proud moment for me because this will be the second time I will playing in the Ranji final. The last time was in 2016, against Mumbai. It is a special moment for Saurashtra. We all believe we can win, having come close twice in the past despite not having a full-strength squad. Against Mumbai, Jaddu [Ravindra Jadeja] was not available, and this time too he might not be there. Luckily this time we have a good young unit. The kind of ability we have in this team was on show in the quarter-final and the semi-final. It was really tough, especially against UP, when we conceded a lead of 170-odd runs in the quarters. We still managed to come back - to chase down 372, the highest ever chase in Ranji Trophy history, which was one of the best victories I have been part of with Saurashtra. Being part of such a unit, which believes in themselves and is committed to the team goal - that is the special thing about this squad. Everyone is working towards one goal: to win the title, win each and every game. Sometimes talent can be overrated, but it is the commitment towards one goal that makes this unit very special. Rahul Dravid has spoken about how you set an example by bringing the same intensity to domestic cricket that you do when playing for India. 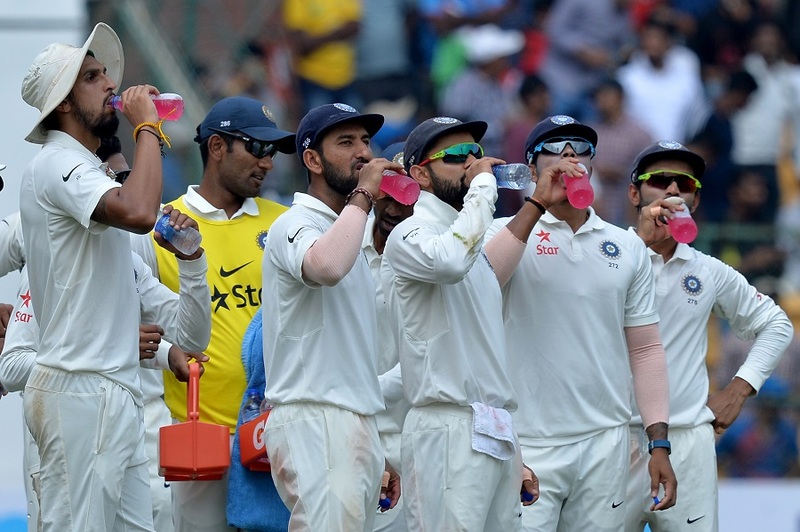 Coming into the Ranji knockouts on the back of a successful Test series, was there any pressure on you to perform? The expectations are on the higher side since I scored so many runs in Australia. It is not easy to start playing domestic cricket, where we are playing with the SG ball on challenging pitches, having played on bouncy pitches against the Kookaburra. I was slightly jet-lagged going into the quarter-final because I did not have enough time to rest and prepare. 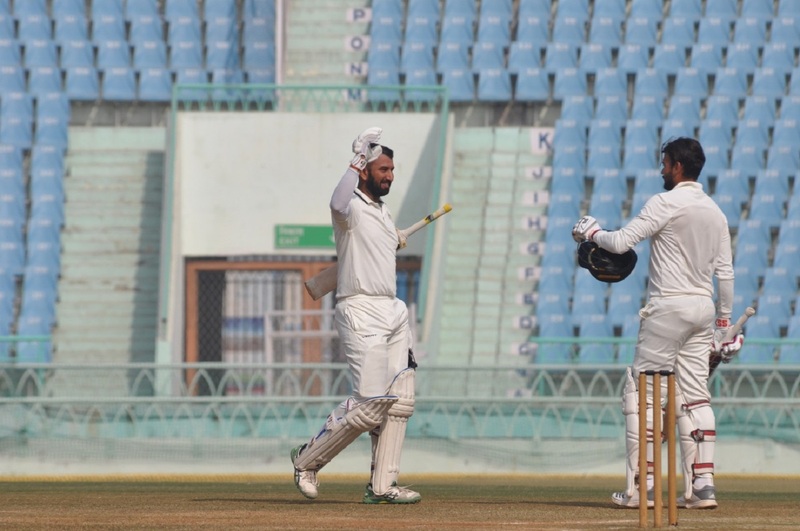 Luckily the knockouts are played over five days, and I knew even if I did not score much in the first innings, I could come back the second time. It makes a difference when your team-mates are willing to do anything to win the game. I know I am experienced, and there are a lots of expectations, but when everyone is committed to one goal, it becomes easier for me to motivate myself and the team members. When you have the positive energy, have an environment where everyone is working hard towards one goal, then it becomes easier. Everyone agrees you made the difference in India's victory in Australia. Has it sunk in? It can't get better than this: when you win a series and your contribution has been on the larger part, it is a proud feeling, a proud moment for me as a cricketer. When you get appreciation from your team-mates, from the cricketing fraternity throughout the world, it is the most satisfying thing. Before the Test series began, every promo, every preview, had Virat Kohli pitted against the Australians. By the end of it, though, Australian cricket was wondering where they would find a Pujara of their own. It is a great feeling when the opposition says they need a player like me. Having said that, I haven't done anything extraordinary. What I have done has been done in the past. I have learned from great cricketers, legends of the game. This is how Test cricket was played in the past and I grew up watching them play in such a manner. Sometimes some people say it is old-school cricket, but what I am doing is reading the situation. You just need to read the situation and bat accordingly. There have been many occasions where I accelerated when the situation demanded it. Because there is not one way of playing Test cricket - it should not be like you just need to play shots or you just have to defend. Four hundreds overseas in the last six months, three of them in Australia. Not many batsmen have achieved that sort of feat. Southampton, Adelaide, Melbourne, Sydney - was there anything you felt was similar in all those innings? Each of those had its own charm. There were some similarities between Southampton and Adelaide because I had to bat with tailenders. Every hundred is special, but I felt that Adelaide was the most important Test match of the series, because in a four-match series if you are 1-0 up, you always have the best chance of winning the series. I remember in 2017, when Australia went 1-0 up in Pune, to make a comeback from there was the most difficult part for us. We won this series in Australia and it is very special, no doubt, but the home series against Australia in 2016-17 was the toughest I have been part of. In Adelaide, India were 19 for 3 and then 41 for 4. To put your head down, play to the situation, mentally switch gears - what was it like? At the start I knew if I could bat well in the first session, I would have an advantage later, because with the Kookaburra ball it always gets easier to bat gradually. They kept bowling in good areas till tea, but having played so many balls, I knew how the pitch was behaving and I could plan accordingly and knew what I had to do even if I had to bat with the tail. After Ash [R Ashwin] we only had tailenders, but I was ready to take my chances. I had worked on a few shots just before the series, so I knew those were shots I could play and accelerate. I had done it in the past many times in domestic cricket. In that Test you had quite a duel with Nathan Lyon. You went forward to kick deliveries away repeatedly. Was that planned? Stepping out against the spinners is part of my natural game and I have always done well doing that. I did not plan to step out and defend [by kicking the ball]. It is just that when I was stepping out and Lyon was getting a few balls to turn in sharply, I felt that was the best option then. It wasn't planned, it just happened naturally. In that particular moment I was in that zone where I was just playing. You cannot think whether there is risk involved or not. I felt it was the best option to counterattack. When you are batting, you have to be in the zone where you are focusing on what is appropriate in that particular moment. When did you realise the strategy was working? After about three-four overs, when he wasn't able to get me beaten. I felt that as long as I was defending, he was not comfortable, because his job was to pick up wickets and he was not getting those. After a point they started sledging me a little bit, so I knew they were getting frustrated with what I was doing and I knew that I was in command, and that as long as I was at the crease, they were in danger. If you figure out a way to survive, I knew I would eventually make the runs. So kicking the ball away was not because you do not play the sweep or the reverse sweep? No. The sweep is not a shot that is very easy to play against Lyon. He has worked on his bowling and he knows what to expect from Indian batsmen. He does not allow batsmen to sweep, with some of his lengths and some of his deliveries. Also, the sweep is not one of my strengths. So I was just trying to back my strengths. India won the toss in Adelaide. Do you reckon winning the toss and batting first - home or way - gives teams an automatic upper hand these days? Not really. Ultimately you still have to bat well. Imagine if we had been bowled out for 120 or 150 in Adelaide and they managed a lead of anywhere from 70-100 runs. Then we might have struggled to come back in the second innings. It is not like winning the toss and batting first will make you win the game. Yes, if you get to bat first overseas on such pitches then there is slight advantage, but you still have to work hard, still have to do the job. And mind you, in Adelaide there was enough assistance for fast bowlers in the first session. The century in Melbourne, was the slowest hundred of your career. What made you play the way you played? I knew that pitch was not easy to score runs on. Maybe if you defended well you could survive, but not score runs. It was an Australian pitch but it was on the slower side. You could not use the pace of the bowler, and it was getting difficult to rotate the strike with the kind of game plans they had. So we knew we had to be very patient. But we knew if we got past 300, we would hold the upper hand, because the Melbourne pitch always offers assistance to the spinners, especially with the variable bounce that is common on Australian pitches in the fourth innings. I just wanted to just carry on the form I had struck in Adelaide, although I did not have many runs in Perth. In the first innings in Perth I was a bit unlucky when I was caught behind on the leg side. It is very rare - not a technical error; it happens in Australia. You must accept that fact and move on. Second innings in Perth, I got a good ball. So we knew the first innings in Melbourne was crucial. It was important to have a good start. The way Mayank [Agarwal] played in his debut Test was remarkable. The domestic experience he had helped him prepare well and be confident. The way he played was exceptional, and having a partnership with him meant a lot to the team. By the time Virat [Kohli] walked in, we were in a good position. We knew that we had to build a partnership and as long as both of us were at the crease it would mean Australia were under pressure, even if we didn't score quickly. Their bowlers were getting tired and we knew eventually there would be a point we would be able to accelerate. Kohli usually likes to keep the meter ticking, whatever the format, but even he was slow and measured, especially on the first day. What kinds of conversations did the two of you have? He understood that it was not an easy pitch to score runs on. Even someone like him, who has lot of shots, could not accelerate or play his natural game because he had to curb his instincts. In the final Test, you batted over two days and almost scored a double-century. It must have been an emotional one, considering your father was having heart surgery at the time. Firstly, I was assured by our family doctors before the Test that he would be okay. He needed the procedure because his heart rate was fluctuating. Dr Patil, who carried out the procedure, was in touch with me and told me to not worry. I was communicating with my wife, Puja, who was travelling with my father, regularly. I knew he was in the right hands and I could focus on the Test match. The surgery was on January 3, the first day of the Sydney Test. Although it was playing on the back of my mind, I am someone who is really mentally tough, so I could focus on my batting. The good thing about that particular Test was that I had scored runs in the series. So my confidence was high. I had already played the practice match at the SCG [in November] so I just wanted to capitalise. 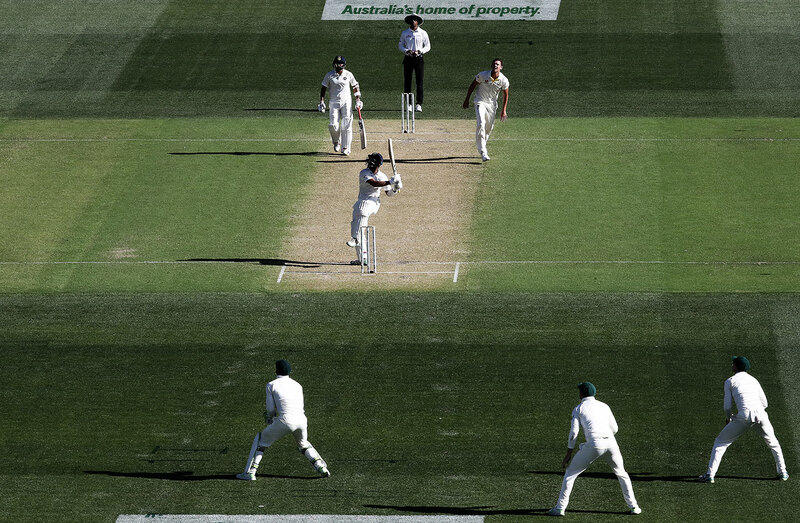 I knew the pitch would offer me some shots and I could play my natural game, unlike Adelaide and Melbourne, where I had to work hard to get runs. You were unbeaten on 130 overnight. Did you manage to sleep well that night, considering your dad's surgery had gone well? It was not easy to sleep. My body was tired. Mentally I was relaxed because my father's procedure was done. But I still had to bat well on day two because it was important to build on the start. I had to bat them out of the Test match - that was my goal and that is exactly what happened. Later that evening my dad told me that the double-hundred was just a number "You've done the job for the team. Don't be sad. Seven runs does not mean much, but the job you have done for the team means a lot." He is a special person in my life. Puja was telling me that, having undergone the procedure, seeing my score, he talked to all the doctors and they were congratulating him. He was so happy to speak to them about the game. For him it was not the procedure. I think he was only thinking of the Test! How did you take missing out on the double-hundred, and getting out with a return catch to Lyon? It happened in the flow. Lyon had bowled so well throughout the series and he deserved the wicket. I just accepted it, because overall what I had done for the Indian team was much more than scoring a double-hundred. You had done it in Adelaide and Melbourne and you did it again in Sydney. The crowds, your team-mates, the opposition, all stood in unison to applaud your efforts. Did that give you goosebumps? No. I am someone who is not bothered about my critics or people who praise me. I gracefully accept both. It means a lot to me, but at the same time it does not change me. You cannot get carried away. You spoke earlier about the home series in 2017 against Australia being the toughest. In both series the focus was on Kohli, but it was you who ended up being the difference. Is that something you're proud of? It is always a special feeling when you score runs for the Indian team. Numbers can differ - I could be the highest or the second-highest scorer, but that is always secondary. When you contribute to the team's success, that is always a proud moment. That is what I look forward to. In what way was 2017 at home different from 2018-19 in Australia? The 2017 series was the toughest, but overseas victories are always special. There are no other special [series] victories I have been part of overseas. The 2017 one, to win that series at home was not easy. The Australians' preparation was up to the mark and they put us under a lot of pressure. In Bangalore [second Test] at one stage we thought that if they went 2-0 up, there was no way we could come back. At one stage we nearly lost that Test, but my partnership with Jinks [Ajinkya Rahane] brought us back into the game. The bowlers then bowled exceptionally well in the second innings. But both series are special. At the time, praising you, Kohli said that people don't understand the "value of Pujara", and about how priceless you were in the Indian team. 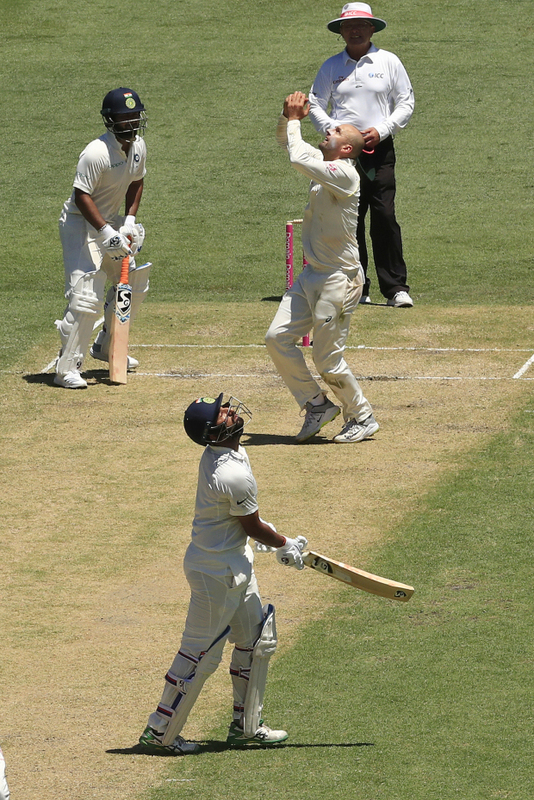 At the end of the Australia series this time, Kohli said: "Pujara teaches us all patience." That patience can be defined in numbers, but how does one learn to be patient at the highest level when there is a Pat Cummins or Josh Hazlewood or Mitchell Starc coming at you at 145kph, or a Lyon using the rough to strangle you? Patience comes from confidence. It also comes from preparation. If you are confident, if you are very well prepared, you know what you are doing. If you trust your defence, if you can trust your game, then patience comes naturally. Batsmen like Kevin Pietersen and Adam Gilchirst reckon if you can defend well, you are telling the bowler who is in charge, and then you can play with freedom. Do you agree? Yes, completely. If you can defend well then you are always on top because you know that you won't get out. When you can defend the good ball, the bowler has to do something else. You are forcing him to try something else. Or you will eventually get a loose ball. So whoever has a good defence will have the upper hand in Test cricket. After this latest series, Kohli said: "Pujara is one guy who is very sure of his own ability. He never questioned any of the calls that the team management took. He took it in his stride. And he realised whatever feedback was given to him by team management were things he himself wanted to work on." Can you talk about the things that the management wanted you to sort out? That is something I cannot disclose. I can give you the bigger picture about what Virat said about me being confident about my own ability. That is something which has helped me throughout my career. Even in first-class cricket, or when I wasn't being selected in the Indian team, there were always some questions which were raised. But I stuck to my game. I realised what I had to do and I kept working on my game. I never doubted my game. I would like to thank my father for that because he is someone who always trusted my game and what I was capable of. I kept pushing myself. I can say that if you are confident about your game, if you are confident of what you are doing, then ultimately you get results. You were benched for the first Test in England, at Edgbaston. Was it because you needed more time to firm up on the changes the coaching think tank suggested? It was a team decision. I can't say much about that because I don't know what the reason behind it was. But I accepted the decision. For me it is always about working hard on my game and knowing what I have to do. The good thing was I had played England in the past, including several stints at different counties. So for me it was just about waiting for the opportunity. I was very confident with my preparation. Even during the Yorkshire stint [earlier in the 2018 season] if you ask any of the support staff or players, they will tell you how hard I worked on my game. Before the England series I was very confident that I would score runs although I had to sit out the first Test. I was very well prepared from the moment I got the opportunity. 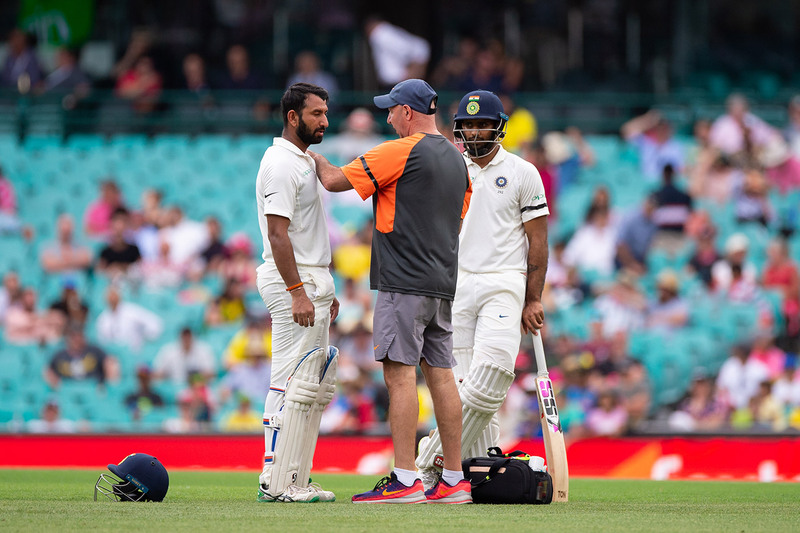 Rahane spoke about his disappointment at being dropped in the first two Tests of the South Africa series in 2017-18 and vowing to come back in the final Test, in Johannesburg. Can you talk about your feelings when you were dropped at Edgbaston? It is never a good feeling when you are out of the team. You feel hurt. It is a difficult thing to accept. But I am always a positive person. I try and control things I can control, focus on things which are important for me as a cricketer. And you have to be very graceful in every aspect about your game and life. The good thing about my lifestyle or my game is I can stay focused on things which are important. And that is what I do even when I am dropped. Tell us about that funny run-out at Lord's, after having played out a searching spell of swing and seam in an overcast first hour at Lord's. It was a bit difficult, but I was very confident because of the way I was batting, although the conditions were challenging and their bowling was very good. Even in such conditions I was very confident the way I was leaving the ball, the way I was defending. I was in command. And then I was run out, which was a bit unfortunate. In the next match, in Nottingham you scored a vital 72 in the second innings, which set up India's only win on the tour. I just wanted to carry forward the confidence I had built at Lord's. I knew the pitch, having played a lot of county matches there [Pujara played for Nottinghamshire in 2016]. Also, their bowling was very similar to what they had in 2014 series. I just wanted to go with the flow. The shot that cut short your first innings in that Test was the hook. I had seen the ball early. I was in good nick, actually, to pick up that ball very quickly. The way I was batting, I knew the big score was coming, and it did come in the second innings. But there was one fielder there and I hit straight into his hands (laughs). I realised that that was one shot I might have to avoid for the rest of the series. You did avoid it in Australia - our logs show just 15 runs off eight such shots in total in the four Tests. Was it a conscious decision to abstain? Yes, you have to realise what works for you and what doesn't. If it doesn't work for you, you might have to avoid playing that shot or only play it when you know that you are in command. So I have only played that shot when I was very confident. With experience it becomes easier. You realise what your game is, and what shots you can play and avoid in some situations and in some countries. You spoke with former Sri Lanka captain Kumar Sangakkara ahead of the England tour. What did you talk about? I wanted to speak to him because of the number of runs he had scored for Sri Lanka in England and the amount of runs he had scored for Surrey. He is an exceptional batsman in world cricket, so I wanted to chat with him and he very kindly agreed. He asked me to stick to my strengths but at the same time to work on a few shots. Also, he talked about what my game plan needed to be - which I cannot talk about. And he spoke about how he was successful and the kind of preparation he used to do. You gave special thanks to the India physiotherapist, Patrick Farhart, after the Australia tour. What was that all about? I had a hamstring injury during the Adelaide Test. It happened when my foot got stuck in the pitch. I had to recover before the second Test and stay fit for the rest of the series. It was not easy for me, and him. The treatment would take long daily. He had to spend a lot of time on it in the evenings, although he is from Australia and his family is there. He would work with me sometimes till ten in the evening. He was very committed and we were in the physio room virtually every single day. He was already treating players during play and dealing with niggles after play, and on top of that he would pay attention to me. Overall how do you look at the last year? You started with a tough series in South Africa, where you scored 100 runs in six innings. 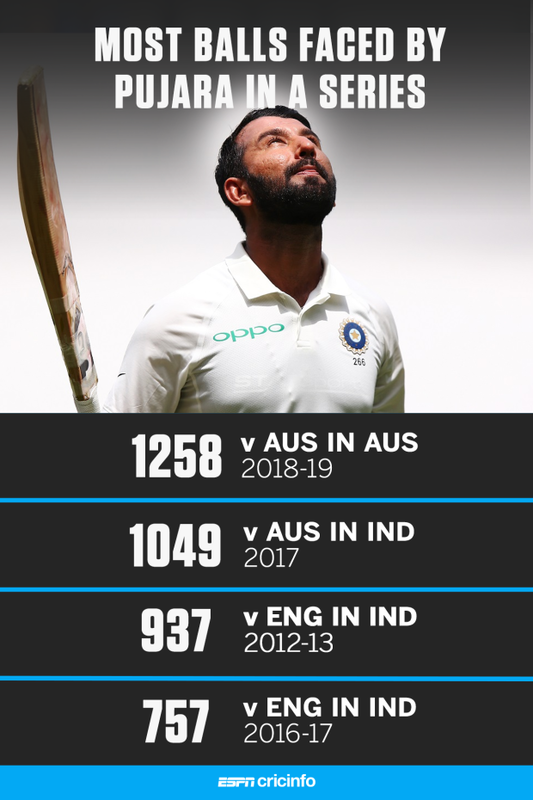 You finished 2018 [including the Sydney Test] as second highest run scorer in Tests, behind Kohli. It has been a special year for me. There were three overseas tours in the same year, which is tough as a batsman. On all three tours we hardly got a flat pitch, where as a batsman you can be assured you will at least score one fifty or hundred. I knew it would be a tough year, but the way things panned out, especially in Australia, was very special. I would say there have been tough times, but there have also been good times. It ended on a very good note. People have started appreciating what I have done and started saying, "This is how Test cricket should be played." The talk of intent that has chased you over the last few years, do you reckon that you have answered that with all these runs in the last year? It has never been about answering anything. It has always been about winning and contributing to the winning cause. I just want to stay focused on the game, contribute to the team's success. People have realised this is what is required in Test cricket and there is no one way of playing Test cricket. Every individual has a different way of playing this format. People respect that now. 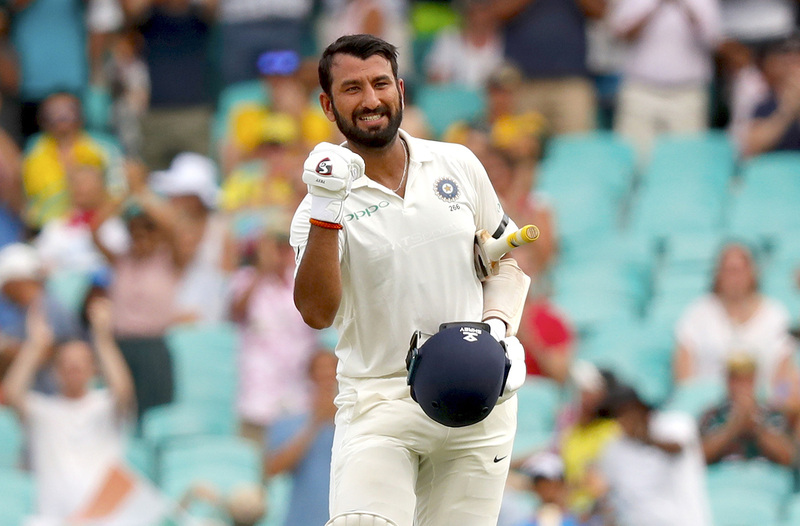 How has Pujara overcome his weaknesses overseas?